This is me and this is my website. Some of the things I have are information on my car (shown below), some cool files and my photo album. To view my pictures you need an account. If you don't have an account and would like one, you can email me at: gregt79@hotmail.com. I have also recently started writing some technical articles. As time goes on I plan to write more of them, and improve their quality, and also user feedback. 6/7/2006: I am now a homeowner. I finally closed on my house today. They aren't kidding when they say buying a house in a lot of work. But all is well, now Shayna and I have our own home. 4/7/2006: I got engaged today. While I was visiting Shayna in Rhode Island, we went down by the ocean in Newport and walked around the docks. There I proposed. 1/23/2006: I'm starting college today. Better late than never I always say. Anyway, I'm going to Schenectady County Community College. I plan on getting my associates' degree in computer science and then transferring to a four year school. 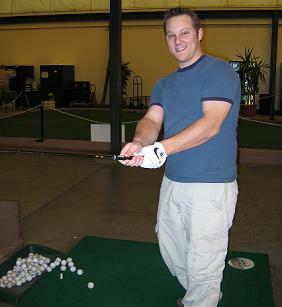 4/29/2005: Today was my best day ever at the driving range. Out of about 110 balls, I hit close to 100 that met my acceptance criteria, which is quite stringent. Straight and far, PW to about 140 yard, 5 iron to about 200, and driver close to 300. 4/8/2005: I bought some new golf clubs today. I got a set of Callaway X-18 irons, 3-PW. They have a nice feel to them, and they should for the price. I willl try them out tomorrow at the golf course and see how well they work. I have posted pictures of them as well as my 460cc beta titanium driver. 4/8/2005: I added this section to my website. This will allow me to document any updates to the website and any new events in my life. Another upgrade currently added to the site is that your username will be saved as a cookie, so anytime you visit the site, the last username you successfully used to logon will automatically be entered for you.